Colin Pearson potter and ceramicist, born in Barnet, north London in 1923. After the Second World War, in 1946, he studied painting at Goldsmiths College, London. It was at Goldsmiths that he met his future wife and discovered clay. Pearson was taught by the potter Kenneth Clark and he began to make majolica wares, influenced by the in-vogue tin glaze ceramics of William Newland, Margaret Hine and James Tower. Pearson, to further his studies in ceramics, joined the staff at Winchcombe pottery in Gloucestershire. It was here that he extended his throwing skills and taught to build up a pot on the wheel in a traditional country workshop. In 1954 he went to work at the Royal Doulton factory in Lambeth, south London, where he was employed in slipcasting in the chemical porcelain department and in the testing of bodies and glazes. In 1955 he went to help David Leach establish a training pottery at the Friars at Aylesford Priory, Kent. Here, they produced slipware and later stoneware, loosely modelled on the Leach pottery in St Ives, Cornwall. Three years later, Pearson began a teaching career, lecturing at Camberwell College of Arts, where his pupils included Mo Jupp, Ian Godfrey and Ewen Henderson, and later at Harrow School of Art and Medway College of Design, Rochester. Experimentation and a belief that rules were there to be broken was a lifelong passion for Pearson, in which his pupils and studio assistants were always actively involved. In 1996 his contribution earned him a rare honorary fellowship of the University of the Arts, London. In 1961, with the help of his wife and the American potter Byron Temple, he set up his own workshop, the Quay pottery, in Aylesford. Here, he made succinctly designed practical tableware – press moulded dishes, big casseroles and plates as well as more individual pieces. 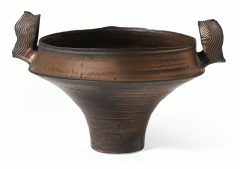 He began to investigate the more expressive potential of ceramics, to prove that the wheel was capable of so much more. 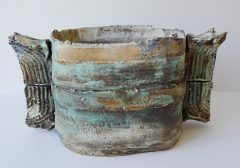 He tried out different modes of throwing, making more sculptural pieces in a softer, more plastic clay on a slower wheel, achieving freer, more rugged textures with irregular, gestural throwing marks. In a major show at the British Crafts Centre in Covent Garden in 1971, Pearson work had changed, his thrown pieces had ‘wings’ to many of the pieces. 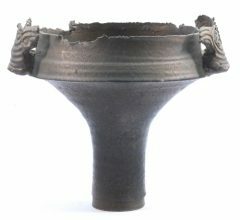 Inspired by ancient Chinese bronzes and Tang and Song dynasty ceramics, he was now radically combining the techniques of throwing and construction. His prize-winning work (awards included the 33rd Grand Prix at Faenza, Italy, in 1975) was shown internationally, and pieces were collected avidly by major museums in Britain and abroad. In the early 1980s the Pearsons moved to north London, establishing a studio in Islington. It marked a new creative period in which he could concentrate on increasingly ambiguous assembled pieces and develop new glazes and surfaces on a multiplicity of forms . With the help of his assistants – Stan McInnes, Marco Toro and daughter Clare – he produced ceramics of even greater constructive complexity. 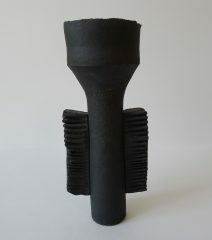 His pioneering use of polyester fibre enabled him to manipulate clay in unexpected ways, folding and bending it into very different structures. Having moved to a final studio in Hackney in 2000, Pearson continued to work, with increased assistance, despite the advance of Parkinsonism, a variant of Parkinson’s disease.